Head lice are blood sucking parasites that can infest people. Although they do not transmit disease, they can cause severe itching, sores, restlessness, and irritation. Adults, nymphs, and eggs are very small and can be difficult to find. A magnifying glass is often helpful when examining the scalp. Adults are very small white to tan, fast moving insects. The viable eggs, also called nits, can be found very close to the scalp and are only visible as grey-white specks. Because school age children generally have close contact with each other, most schools have policies to prevent the spread of head lice. After an infestation is discovered, children are often excluded from schools until they have been treated. The school nurse will often assist in inspection. Both prescription and over the counter medications are available to treat head lice. Vacuuming, disinfecting combs and brushes, and washing clothing and bedding in hot water will help control the spread of head lice in your home. Head lice do not spread disease. You cannot get head lice from pets and animals. 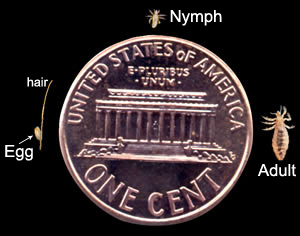 Head lice cannot jump or fly; they can only be spread by close contact with people, clothing, or personal items such as brushes and caps. Hatched eggs or dead lice can be confused with dandruff, styling product debris, or dirt. Head lice do not necessarily reflect hygiene. They spread easily, and some even prefer clean hair. People with long and short hair can have head lice. Lice found on other parts of the body.